Limited to just 200 sets worldwide! The General Post Office building proudly stands in the heart of Dublin and is the home of Ireland’s main postal service. This magnificent building has borne witness to some of the most defining moments of Irish history. It was the headquarters for the leaders of the 1916 Easter Rising after it was seized by members of the Irish Volunteers and the Irish Citizen Army, and it was where Pádraig Pearse read aloud the Proclamation of the Irish Republic on Monday 24th April 1916. As the communications centre of the country, it was here that the leaders of the uprising proudly hoisted the flag of the Irish Republic high above the building, declaring that armed revolt was the only feasible means of achieving independence. The building still bears the scars of the battle that raged to this day, and has naturally become a powerful icon of Irish nationalism, adorned by statues of Cú Chulainn and Hibernia that celebrate Ireland’s unique history. 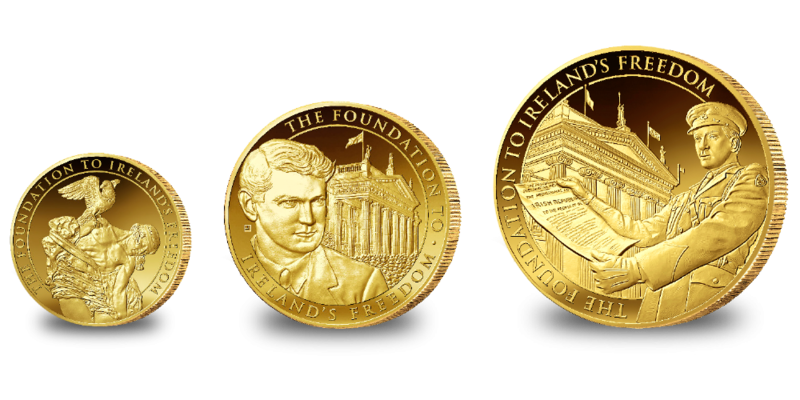 The GPO 200 Gold Prestige Set has been struck to the highest Proof quality in pure 24-carat gold, and each medal features the phrase “The Foundation to Ireland’s Freedom’ inscribed on the reverse, alongside iconic images of Padraig Pearse, Michael Collins and Cú Chulainn and the struggle for Irish independence. The obverse depicts Lady Hibernia stood proudly atop the GPO holding her spear and harp, surrounded by the words BUNÚS SAOIRSE NA H ÉIREANN. The set has a very low issue limit – only 200 sets are available for this important anniversary, making this a very special collection. You can be one of a select few to secure this stunning commemorative set.